We have all been there. You might be thinking of either getting a new bike or another setup to ride another discipline, and at some stage you would have thought about which wheel size is best. Is it 24″, or 26″? So in this post I am going to talk about the pro’s and cons of both 24″ and 26″ bikes, and what you can get for your money. There is no denying that a lot of the pro riders these days who ride street are using 24″ bikes. Not all of them, but most of them. The main reason is that the bike becomes lot more flickable and easier to chuck around. A lot of riders who we know that are making the move from BMX to MTB street, and just feel that 26″ is just a little to big to ride. 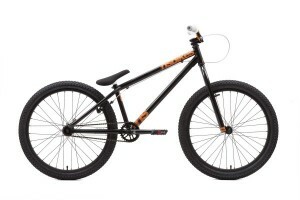 So they are looking for something that has a similar feel to a BMX. Riding a 24″ bike is also easier to spin, generally lighter and stronger. This isn’t always the case as you could kit your 24″ with lots of bomb proof parts, of course its going to be heavier. Generally wheels that are 24″ are pretty damn strong. Such wheel builds that use the Sun Ringle Rhino lite 24” rim, built onto a 32h hub are very rarely going to buckle, and can take quite a serious beating before they start to bend. Other rims to consider when looking for a 24″ rim are NS Fundamental, Atomlab Pimp or the Octane One Solar. The acceleration you also get from a 24″ is a lot quicker than a 26″ which is why a lot of 4X riders use them. To be perfectly honest there is no real advantage of using 26″ wheels for street riding. Some people however just don’t get a long with 20″ or 24″ for street. Most people who do tend to ride with 26″ wheels for street, may also do another discipline on the same bike, which they feel more comfortable riding a 26” bike on such as Dirt jumps. On the other hand I’ve known riders go from 26″ to 20″ purely because they love how easy a BMX is to chuck around the skatepark, and if you can 360 a big old 26″ bike, spinning a little 20″ feels like a walk in the park. One point to take on board is if you are thinking of making the change from 26″ to 24″ wheels is to run a frame that’s actually is designed for 24″ specific. You hear riders all the time saying they are now running 24″ wheels on a 26″ frame. Which is just awful. The frame has not been designed around 24″ wheels and will feel terrible to ride. Here at Street Ride we are big fans of 24″ bikes, so If you are on a budget and are looking to make the move from 26″ or 20″ to 24″, we have picked two of the best value for money complete street bikes and frames currently available. 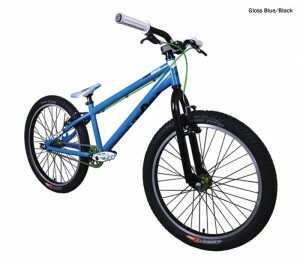 First up is the NS Bikes Holy 2 Bike 2011 from only £399.00. We have talked about the NS Holy 2 before simply because it is such good value for money. Fully kitted out with so many NS parts, it really is one of the best complete street bikes available. This bike is also available in 26″ as well as 24″ so we are covering both bases with this particular model. This again is a start up bike, but you do get a lot of DMR parts included with this bike. Again this bike is available in either 24″ or 26″, which gives you the option. The DMR Drone comes with 135mm rear hub spacing and a heat treated downtube, with the standard head tube reinforcement. 3piece cranks as standard, as do the DMR Digger tyres and not forgetting tones of DMR bits including V8 pedals. At the end of the day it is up to you what wheel size you decide to run, and what you feel most comfortable on. Would love to hear your thoughts on the subject. So what wheel size do you run? Or if you have more than one bike, which do you prefer? You’re forgetting BMX cruisers are another option. Mostly for racing (so low bottom bracket, really stable, but surprisingly difficult to manual), some are designed for street, such as the Sunday Model C. This is meant to feel like a BMX, but the larger wheels mean it will roll better on trails than a BMX.